Most syntax highlighters use either shortcodes or make you add some obscure CSS classes to all <pre> tags that you want to highlight. Even WordPress.com does that. No shortcodes, no custom CSS classes — just magic. How’s it better than highlight.js? Kaspar, it isn’t. Both of these (prettify.js and highligh.js) are my favourite syntax highlighting libraries. Do you prefer highlight.js? Yep, I do. No clear benefits over google-code-prettify, though. Just stuck to one I found smallest and fastest. I have also custom plugins on live sites with different js libs, very often highlight.js. But a small hint. I think it is a good idea in your source to check for if ( ! is_admin() ) before enqueue script. If it is only usable on frontend. Thanks for your fast feedback. I mean that was not clear, I had read before long time the comment on core topic. But then is my comment off topic and maybe a hint for to debug this for clarify. Yeah, Frank, that comment refers to “_script” — notice the missing “s” at the end, which I am referring to in my comment. 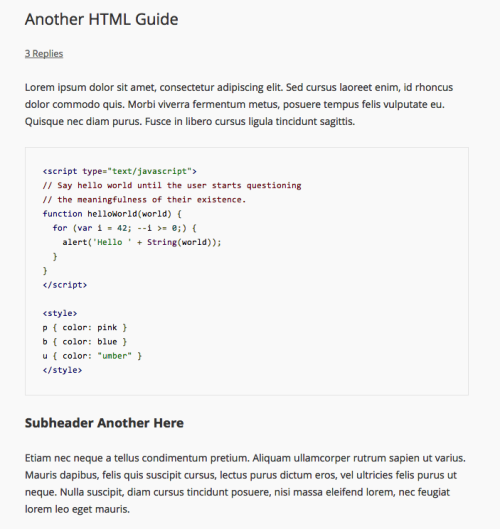 Romain, simply wrap the code in <pre></pre> tags. Romain, you can see it works if I wrap your sample code in <pre></pre> tags. But you need to write spaces to indent code ? It doesn’t matter if you use tabs or spaces as long as it is wrapped in <pre></pre> tags. Browser will ignore any kind of indentation if it’s not inside <pre></pre>. Question, how do I change CSS type (“Skins”)? Let’s say I like “Desert” skin, do I load its CSS into my theme CSS? I’ve been using this for a while now, and am very happy with it. It’s much simpler to use than the Syntax Highlighter Evolved plugin I was using before, and it’s lighter on code too. Is this available from the official WordPress plugin repo (https://wordpress.org/plugins)?